Combine flour, sugar and salt in a medium bowl. Add shortening and butter and cut until mixture resembles course meal. Mix in enough water by spoonfuls to form a dough that comes together. Gather dough into a ball and flatten in to a disk. Wrap with plastic wrap and refrigerate for 30 minutes. Roll dough out on a lightly flour dusted surface to a 1/8 thick round. Transfer dough to 9” diameter removable bottom tart pan. Trim and crimp edges. Refrigerate for 30 minutes. Preheat oven to 375’ degrees. Fill shell with pie weights or dried beans. Bake for 15 minutes remove beans and then bake for 10 more minutes or until golden brown. Cool completely on rack. 1 8 oz. pkg. cream cheese at room temp. Using an electric mixer beat cream cheese, sugar and lemon juice in a large bowl until well blended. Add whipping cream and beat until light and fluffy, Spread filling into tart shell. Cover and refrigerate over night. 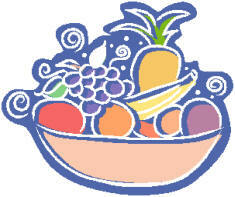 Arrange fruit in concentric circles on top of filling and refrigerate. Can be prepared up to 3 hours in advance. Bring preserves and 1 Tablespoon water to the boil in a small heavy sauce pan. Strain and brush glaze over fruit and serve.